Dream of launching a new product, project or startup? Wish granted! Thanks to crowdfunding, today’s hottest form of investment, suddenly anyone can bring any idea or invention to life on the Internet. 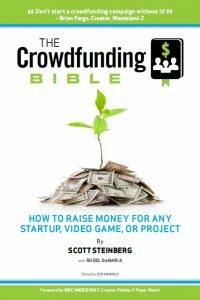 The world’s leading guide to raising money online, The Crowdfunding Bible shows you how to launch, market and successfully run a high-tech fundraising campaign, regardless of industry or budget. It reveals the secrets to catching the media and public’s eye, and attracting donors, in a language that everyone can understand. From books to films, albums, events and consumer products and video games, dive in to discover the new world of venture capital waiting at your fingertips. FEATURES: Best Crowdfunding Sites and Services / Full Guides: How to Start & Promote Any Project / Expert Tips and Advice / PR and Social Media Strategies / Advice from Top Creators.